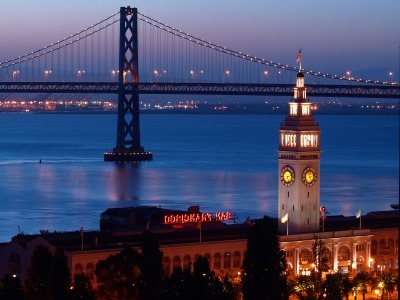 The Ferry Building in San Francisco is a historical landmark that attracts tourists, and is adored by locals. A glorious, bustling marketplace, with farmers' markets Thursdays and Saturdays, and a plant and craft market on Tuesdays and Sundays, this is a great stop if you are looking for unique items to bring home, or if you want to sample some high-quality, San Franciscan, artisanal fare. For a “foodie”, it should be on the must-do list! If you want to avoid navigating through hordes of people, and you don’t plan to do any shopping at the farmer’s market – go on Monday or Wednesday, when you won’t have to battle the market and weekend crowds. The Ferry Building in San Francisco sits on the Embarcadero at the east end of Market Street. You can take BART (all lines), Muni, the F-Market Street Car, the California line cable car, as well as a ferry to get there. Hours: Mon-Fri 10-6, Sat 9-6, Sun 11-5. Hours of individual businesses may vary. The Ferry Building hasn’t always been the gorgeous place that it is today. Having been through many incarnations, the Ferry Building began as a major thoroughfare for ferry transport when it was first built in 1898, only to be nearly forgotten once the Bay Bridge and Golden Gate Bridge were built in the 1930s. Used as office and retail space for a couple of decades, ferry transport did not resume until 40 years later. One of the few structures to survive the 1906 earthquake, the Ferry Building also remained strong through the 1989 Loma Prieta earthquake. Thankfully, the ’89 earthquake damaged an unsightly, double-decker freeway that blocked the Ferry Building from the rest of downtown, inspiring a face-life to the whole waterfront region. Before the revamp made the Waterfront look as it does today, I remember driving through this area with my mom when I was a little girl, and thinking what an unattractive place it was. Although not everyone anticipated how positive the change to this region would be, today the benefits are obvious. 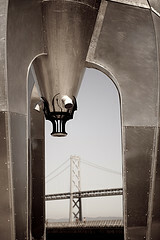 A local tip: Keep an eye out for the Raygun Gothic Rocketship sculpture (pictured above) located on the right side of the Ferry Building if you are facing the bay. Chocolates, great coffee, artisanal cheeses, hand-crafted olive oils, butchers offering high-quality, sustainably-raised meats, seafood vendors, an organic produce store, a few cafes, plus a couple of amazing restaurants. Specializing in locally produced, artisanal cheeses, if you are up for a day trip out of the city, you can visit these guys at their original Point Reyes location. It’s a great excuse to go explore some of California’s stunning coastal scenery. Otherwise, check them out in the Ferry Building in San Francisco and sample their signature cheese – the triple cream Mt. Tam! Yum! The beans that they use to make their coffee are never less than 48 hours from being roasted! The aroma is so fresh and distinctive - you’ll know when you are walking by them! Specializing in quality pork products, this place is a must for lovers of sausage and salami. You can have a panini, or order their famous salumi cone, an easy-to-snack-on sampling of their cured meats served in a paper cup! I tried their Lonza with peach panini. Delicious! With an impressive selection of quality, artisanal wines from all over the globe, this is a must for wine lovers. The staff is knowledgeable, and you can pair your glass of wine with a delectable snack, such as an assortment of meat or cheese plates, or a side of marinated olives and mushrooms. A nice souvenir to bring back home, you can sample the different varieties of oil at their location in the Ferry Building. One of my favorite Vietnamese restaurants in the city, they are usually booked weeks in advance, so it’s necessary to plan ahead to eat there. Try the shaking beef, and ask your server to suggest something from their wine list, which has been thoughtfully selected to match the menu well.